Even with all the windows open, on a hot summer’s day you won’t get much ventilation if there’s no breeze and no air passing through the office. 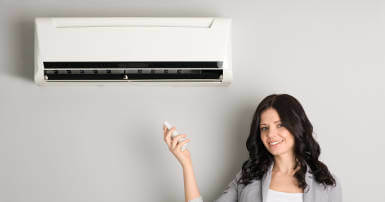 Keep your space well ventilated with an air conditioning system and you will have a team that is awake and productive rather than one that feels sluggish and is struggling to focus. If the temperature is fluctuating there will only be a small window of time when that optimal point is reached where it’s not too hot and or too cold to allow people to focus on their work. During a sweltering summer that may be so early in the morning or late in the evening that no one is in the office! Maintaining a constant temperature allows people to focus on their work and be productive without trying to find a cooler spot in the office, regularly seeking cold drinks or ice cream to cool off, or a distraction from how hot and uncomfortable they are feeling. A space that is cool enough to work in is one that staff want to be in. By offering somewhere where they can escape from the scorching heat, they will not only be happy to be there, but they will also be able to focus on the task at hand. A cooler space is one where they are not looking for a fan or an open window for some relief from the heat, which means they are not wasting time. Which in turn makes them more productive. It also acts as a morale booster if they are in a pleasant environment, not to mention it shows that employers care about their staff’s comfort and wellbeing. Employers have a duty of care and not providing a suitable environment for people to work in breaches that requirement. That duty of care also has to take into consideration those who may not be able bodied, who may be on certain medication and therefore adversely affected by the heat, or those who are pregnant. Having to send staff home because their working environment is unsuitable leads to loss of earnings and unhappy staff.